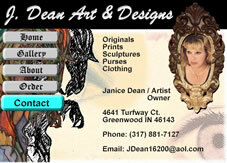 Description: I took a dreamweaver class at IUPUI. This class was specifically geared towards creating a website in photoshop and then cutting the website into small pictures, that when assembled together, represented a website. We used and experimented with the cutting tool. 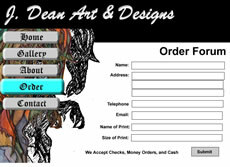 We had to come up with a Website Based Project using Dreamweaver. I was working at the time at the Greenwood Park Mall. 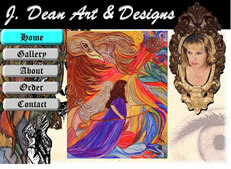 Jan Dean, my old supervisor had came to me and asked if I could make her a website to sell her artwork and to dispaly it. I agreed and came up with this site for her. I found being a fellow artist myself I knew what she wanted and that was to have a gallery to display her artwork and to get her name out there. 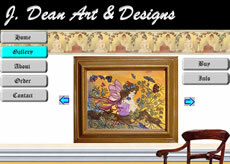 I tried to match the site with the themes of her paintings. Her artwork tended to remind me of Fantasy like fairies, angles, etc. and has a Medieval look to it.